Radiesse is a safe, FDA-approved dermal filler that is able to reshape the facial contours and restore a more youthful appearance. Comprised of a calcium-based gel, this filler creates a scaffolding effect by encouraging and supporting new collagen growth. Radiesse can be used to eliminate dark hollows beneath the eyes, create cheekbones, fill deep creases, add volume to hands and sculpt the jaw line. Radiesse is highly effective at filling deep scars and smoothing the lines in the face. Used primarily to treat areas with obvious signs of facial aging, Radiesse does more than other fillers that simply work to erase wrinkles – it rebuilds your skin’s foundation and restores your youthful look. Its unique contouring ability allows physicians to treat large areas of the face in one procedure. Radiesse can help you treat signs of facial aging, smoothing the nasolabial folds that extend down from the nose, the marionette lines beside the mouth, and treat facial fat loss caused by aging and other conditions. Radiesse works with your body, below the skin’s surface. It is an injectable filler made of synthetic minerals. A gel carrier delivers the particles and holds them in place. 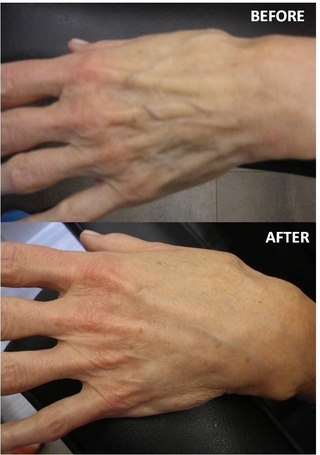 When injected, the gel carrier creates a temporary fill, lasting anywhere from three to six months. The calcium particles left behind create a scaffold for your tissue to build around which creates the longer-term fill. Radiesse creates a scaffolding effect when injected beneath the surface of the skin, encouraging and supporting new collagen growth. The skin’s foundation is rebuilt, resulting in a more youthful appearance. Radiesse can literally redesign the face by eliminating dark hollows beneath the eyes, creating cheekbones, filling deep creases, and sculpting the jaw line. The results are long lasting and do not involve the risks associated with permanent fillers or implants. Dr. Freund injects Radiesse into carefully selected areas of your face that have lost volume and formed a crease or a line. During the treatment, the Radiesse filler is injected into pre-determined areas often mapped out on the face. Topical anesthetic may be used, depending on the sensitivity or depth of the targeted site. There is a slight sting upon injection but there is very little discomfort afterward. When injected into the skin, the active ingredients attract water particles and cause a small amount of connective tissue to form around them. As a result, wrinkles and folds will appear smoother, and in many cases, the nasolabial folds will disappear altogether. After injection, it is common to gently massage the treated area to ensure an even distribution of Radiesse beneath your skin. 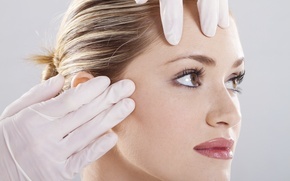 Dermal filler treatments can take just minutes per area to perform and are nearly pain free. The procedure is done with a very fine needle that minimizes the discomfort of the facial filler injection. After the treatment, you will see results almost immediately that will continue to improve after a few days time. The results are long lasting due to the calcium-based microspheres suspended in the water-based gel. Your more youthful look will last longer because while the Radiesse filler immediately improves the treated area, these microspheres will continue to stimulate your skin to produce new collagen, restoring and providing for a prolonged healthier natural look. Patients may experience some slight redness and mild swelling after the injection, though these side effects tend to resolve quickly. Work and other normal activities can be resumed immediately after treatment, though some patients prefer to wait until the redness and swelling have subsided. The results of Radiesse can last up to two years or longer in some areas of the face. Radiesse allows you to resume your daily activities immediately. You may experience some mild swelling or redness at the injection site that typically last no longer than a day. One treatment may last a year or longer. By having a touch-up treatment, results may last 18 months to two years. You will begin to see the positive effects of Radiesse injections almost immediately and your treated areas should look great and maintain their improved appearance for up to two years. Dr. Freund’s September Specials – Receive Up to $150 in Gift Cards!